Set in a fully realised, authentic recreation of Tokyo's 'Sin-City District' the deep and interweaving crime drama of Yakuza 4 unfolds through the eyes of four unique and dangerous characters. Playing as the legendary Kazuma Kiryu, the loan shark Akiyama, escaped convict Saejima or detective Tanimura, players will need to survive the dangers and temptations of the Japanese underworld. After I played the previous installment to this series, I very much enjoyed the gameplay, the story and the brutal street fighting. I'm sure it's not strange for a female gamer to have fun beating people violently with bikes! 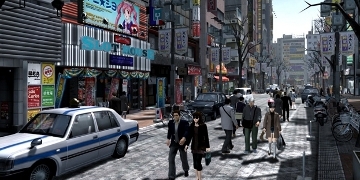 The gameplay is not linear and open world to complete side quests. 4 different characters but in 1 epic story! 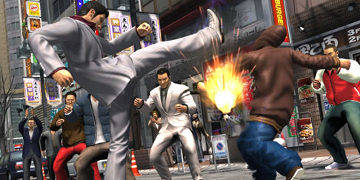 This is no doubt is the greatest and coolest yakuza games in its series. Every mystery and question will be answered in yakuza 4. So if youre a yakuza fan, this one cant be missed. A great, great game! Maybe not the best you will ever played, but still welcomes you with its Japanese culture. I love this game! I spent hours playing this game already. Whoever is looking for a game similar to GTA but also loves the asian touch should have a look. A great story. Lots of fun. It has lots of cinematic sequences, but they are really good I think. The gameplay is brilliant also. Yakuza 4 is a very cool game.I haven't played the other 3 games but this one is very good, and also authentic. It's easy to get the hang of at the start, and has a great storyline as well as so many additional quests besides the main one. And the mini-games are just so cool! It is like some kind of Japanese GTA and Mafia game, but somehow so much better. If you like Japanese games, you shouldn't miss this marvelous piece of crime adventure in the red-light district of a Tokyo-like city. What can I say? I recently discovered this saga and I'm surprised how they manage to improve the quality of this game every new title. If you like action game with a really good story, I suggest this game a lot. It has also got a menu where it talks about what happens in the original three games. The best Yakuza game ever! Fantastic story and endless sub-stories. There's hundreds of hours of gameplay! As always, a perfect service and a brilliant product!